Why Does the NSA Have Secret Documents on Seth Rich? Your request has been processed under the provisions of the FOIA. Fifteen documents (32 pages) responsive to your request have been reviewed by this Agency as required by the FOIA and have found to be currently and properly classified in accordance with Executive Order 13526. These documents meet the criteria for classification as set forth in Subparagraph © of Section 1.4 and remains classified TOP SECRET and SECRET. Presumably Publius Tacitus knows Clevenger. So the key question is this: why does the NSA have 32 pages of secret or top secret documents (which of course they refuse to release) pertinent to Seth Rich and Julian Assange? However,.what if the FBI was investigating Rich for espionage — rather than probing his murder? The FBI did not flatly state that they had not looked at his laptop. Although Hersh has refused to go public with this story (he likely has only one source for it), he had an opportunity to state that he had been BSing Butowsky — but refused to do so. Which likely means he was being honest when he told Butowsky about a source inside the FBI, considered highly reliable by Hersh, who described to Hersh seeing an FBI memo regarding an FBI analysis of Seth’s laptop. That analysis indicated that Seth had arranged with Gavin Macfayden of Wikileaks to provide DNC emails to Wikileaks via drop box in exchange for a payment. Another pertinent issue has recently caught my attention. There is strong reason to suspect that Guccifer 2.0, far from being a Russian intelligence agent, is a Deep State creation meant to establish the hoax that Russian hackers were the source of the Wikileaks DNC releases…. 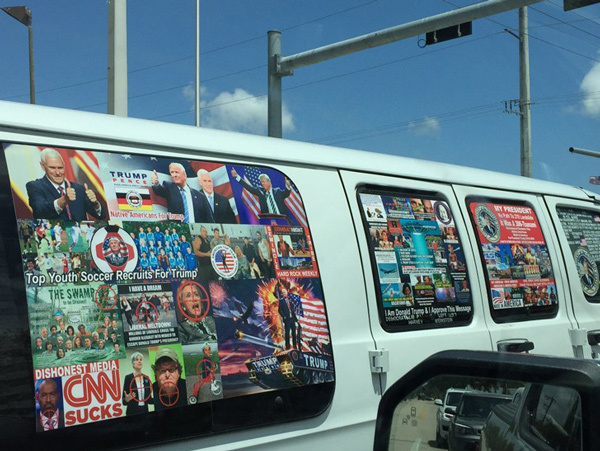 Take a look at the van that the supposed perpetrator was driving. Very high production values, not a spot of dirt or wear or fading on either the van or the posters. This is right out of a hollywood script. This was such an obviously fake production that I have to wonder if it was intended to be exposed. If so, the MSM will turn it around as a false flag of a false flag. The narrative would be that trumpsters set it up to be exposed as a false flag in order to indict the democrats for conducting false flags in the public mind. And who knows, maybe that’s what happened. Except it wouldn’t be trumpsters, it would be the faction of the intelligence apparatus which is arrayed against the globalists. When deception is the rule it’s hard to know what to believe. But as far as I’m concerned it doesn’t whether it’s a false flag, a false flag of a false flag or a false flag of a false flag of a false flag! The underlying reality is that the NWO cabal has taken over the democratic party (and much of the republican party), and if the dirty tricks apparatus of the nationalist faction in government use their own tactics against them, it could be argued that it was a “necessary evil” given the cluelessness of the american public. Anyway, the narrative that seems the most politically constructive to me is the simplest one: through sheer incompetence reflecting their own internal disarray and growing desperation, the “deep state” has managed, in one enormous blunder, to expose all of its biggest left-wing public deceivers in a very concise way for everyone to see. The supposed targets of the plot are the public faces of its primary authors. This position would seem to be supported by MSNBC’s clumsy attempt to pin it on the russians, implying that they are improvising around an unexpected development by muddying the water, that they have lost control of the situation. I mean really. Wasn’t that yesterday’s big lie? Known as “the Monsanto papers”, the evidence presented in legal cases against Monsanto includes email correspondence and corporate documents that create a comprehensive narrative of the corporation’s malfeasance and collusion with U.S. regulatory agencies. The Australian documentary, “The Monsanto Papers” (featured below), reveals the secret tactics used by global chemical giant Monsanto (now owned by Bayer AG), to protect its bestselling herbicide, Roundup. The film starts out with a quick history of Roundup and how its now-clearly absurd safety claims (such as “it’s biodegradable,” “safe enough to drink,” and “safer than table salt”) made it into the worlds’ most widely used weed killer, used by farmers and private gardeners alike. Indeed, it was at one time known as “the world’s most trusted herbicide,” but those days are now long gone. Between 1974 — the year glyphosate entered the U.S. market — and 2014, glyphosate use increased more than 250 fold in the United States. Today, an estimated 300 million pounds are applied on U.S. farmland annually, and globally, nearly 5 billion pounds (over 2 billion kilograms) of glyphosate are applied to some 70 types of farm crops each year. To read much more, including which health consequences have been linked to glyphosate, click here. First they talk about the “big lie” propaganda technique, then russia attacks again. The irony is hard to miss, unless you have an MSNBC dependency. VOX Asks: Is it Time We Started Adding Lithium to Water Supply? Involuntary and uncontrolled dosages of random people with varying rates of excretion with a drug that that has a narrow margin for error and loads of cross-drug interactions and contraindications but which causes apathy (closely related to suggestibility) and male infertility. Don’t expect this proposal to go away. In an article entitled “How our drinking water could help prevent suicide,” Vox highlights psychiatry professor Nassir Ghaemi and his claims that the practice would be beneficial for the American populace. “High-lithium areas, he says, have suicide rates 50 to 60 percent lower than those of low-lithium areas,” Vox writes, citing a study co-authored by Ghaemi. Comparing such a move to “the way we put fluoride in to protect our teeth,” Vox adds, however, that countless studies prove lithium to not be effective whatsoever. Vox argues that mass-drugging the U.S. citizenry, if alleged to be effective by scientists, should be done anyway. “At the very least, I’d love for some governments to conduct real, bona fide experiments on lithium,” the article states. Such a policy, Vox continues, would be ethically sound so long as the practice is deemed to be more good than bad. “There are serious ethical questions about doing experiments like this that affect whole populations, but if lithium’s effect is real and we don’t pursue it because we lack compelling enough evidence, thereby endangering thousands of people — that’s an ethical problem too,” the article adds.